The Natural Start Alliance, the International Association of Nature Pedagogy, and the Northern Illinois Nature Preschool Association are combining their 2018 professional conferences into an international event for all who work with young children and value nature-based education. During the conference, my colleague Dave Catlin and I will be presenting a concurrent session on different business models for operating nature-based preschools. To attend, participants must register for the conference here. Fee ($350) includes snacks, lunches, handouts & take-home resources. Michigan SCECHs available (pending approval). Each day runs 8:30am to 4:30pm. To register call Chippewa Nature Center at 989-631-0830 or visit www.chippewanaturecenter.org. If you have any questions, contact Madison Powell at 989-631-0830 or mpowell@chippewanaturecenter.org. You can also download the flyer here. I am excited to be one of two keynote speakers and a session presenter at the April 7 "In Bloom Conference" in Asheville, NC, hosted by Antioch University of New England. The conference will feature morning and afternoon keynotes and two workshop timeslots to actively engage in the nature programming of your choice. All events focus on the educational and health benefits of being in the natural world with children. My keynote is titled From Preschool to Early Elementary: Learning from One Community’s Journey with Nature-based Education. David Sobel, of Antioch University of New England, will be the other keynote speaking on Nature Preschools and Forest Kindergartens. Registration will open in mid-January. To register, or for more information, click here. To view the event brochure, click here. Nature-based early childhood education is growing in popularity in the U.S. Yet many parents and educators are wondering about this unique approach to teaching young children. How is it beneficial? Are children in these programs successful in kindergarten and beyond? I will answer these questions and more in my presentation as part of Cleveland Metroparks Nature Preschool Speaker Series. For more information contact Cleveland Metroparks at 440-734-6660. The Midwest Environmental Education Conference (MEEC) is a professional development collaboration between four states—Illinois, Iowa, Minnesota and Wisconsin. The EE Associations in these states invite all to join together for local field studies, educational sessions, trainings and workshops focused on environmental, cultural, and historical interpretation and education. MEEC is held every two years, and the 2017 conference is being organized by the Environmental Education Association of Illinois. I'm honored and excited to me one of this year's keynote speakers. I will also be providing a one-hour concurrent session "Developmentally Appropriate Practices--The Dos and Don'ts of Working with Young Children." Attendees must register for the conference. You can learn more and register here. I will be presenting a concurrent session with my colleague, Dave Catlin, on business planning related to starting up a nature-based preschool. I will also be presenting a research poster related to a project I've been working on with David Sobel and Dr. Lori Skibbe. Session attendees must be registered for the conference. 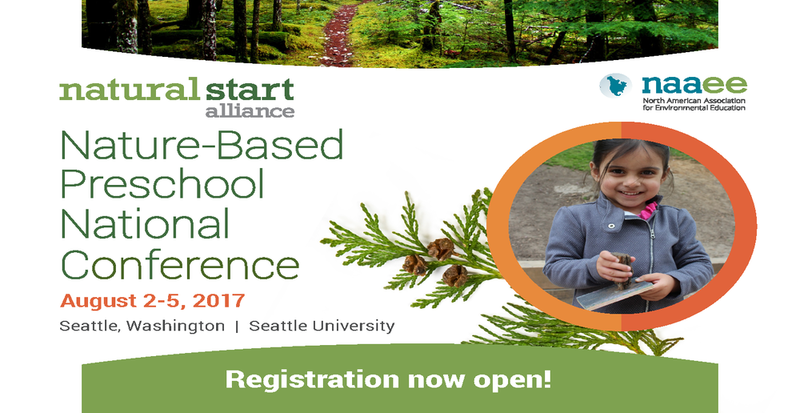 For more information about the Nature-Based Preschool National Conference, click here. Fee ($400) includes snacks, lunches, handouts & take-home resources. Michigan SCECHs available (pending approval). Each day runs 8:30am to 4:30pm. To register call Chippewa Nature Center at 989-631-0830 or visit www.chippewanaturecenter.org. (Registration will be open January 2.) If you have any questions, contact Madison Powell at 989-631-0830 or mpowell@chippewanaturecenter.org. You can also download the flyer here. Participants will also observe West Side Christian Nature-based program in action and facilities. Fee ($400/ $375 for the first 10 early bird sign-ups) includes snacks, lunches, handouts & take-home resources. Certificates and Michigan SCECHs available (pending approval). Each day runs from 8:45am to 4:00pm. To register click: Nature-based Education Workshop. If you have any questions, contact Janet Staal at (616) 735-6240×23 or janet@BlandfordNatureCenter.org. I'll be joining Claire Warden and her Mindstretchers team as part of the conference portion of the May 2017 Study Tour. Join us! It is sure to be a fabulous week! Click here for more information or here to see the Study Tour flyer. Looking forward to presenting three concurrent sessions at this event. (Also super excited to get to see Jim Gill's keynote!) Registration is required and is open April 24th through May 8th. If you have any questions, contact Angie Bruning at bruninga@amaesd.org or (989) 354-3101, Ext. 124. For the program guide, click here. I am excited to be one of two keynote speakers and session presenters at the April 22 "In Bloom Conference" in Kittery, Maine, hosted by Antioch University of New England. The conference will feature morning and afternoon keynotes and two workshop timeslots to actively engage in the nature programming of your choice. All events focus on the educational and health benefits of being in the natural world with children. My keynote is titled From Preschool to Early Elementary: Learning from One Community’s Journey with Nature-based Education. Amy Butler, of North Branch Nature Center, will be the other keynote speaking on A New Path in the Forest: Moving Beyond the Classroom for Exploration, Creativity and Growth. I'm excited to be presenting a session titled "Integrating Nature into the Preschool Classroom--Both Indoors and Outdoors" at the Central Michigan Association for the Education of Young Children's (CMAEYC) annual conference. This requires conference registration. For more information or to register, click here. Science: How does water move? Explore the properties of water; test theories of solid, liquids and gas as we create water systems in the room. Technology: Why doesn’t the spider stick to the web? Use technology to look at the fascinating world of spiders and gecko feet to unlock how things stick. Engineering: Who teaches a bird how to build a nest? Nature’s engineers are very skillful. Explore how termites, bees and birds have amazing skills to be engineers, construct structures using nature as a provocation. Math: Why is a banana curved? Is it possible that the natural world is actually mathematically designed? Unlock the mysteries of spirals, curves and whorls. Leave the sessions with more enthusiasm, knowledge and skills than when you came in! Receive a Nature Passport to share with others as a record of the thinking you have done at the start of your Journey into Nature to learn about S.T.E.A.M. International educational consultant, working across Australia, Canada, USA and Europe. The centre for excellence she has set up in the UK is renowned for Auchlone Nature Kindergarten and the consultative Floorbooks used there. Her own learning pathway as a teacher, involves working in a wide variety of settings (2-18 years), mentoring and advisory work, authoring over 14 books and designing resources and landscapes. Claire is an international advisor to the Children and Nature Network, World Forum Foundation and the International School Grounds Group. She was voted Exceptional Master Leader in the field of Early Care and Education, is a Visiting Fellow at Strathclyde University and is currently engaged in a PhD exploring Nature Pedagogy.